Does faith inform your vote? This week we hear from two evangelicals on how their religion informs their stance on Trump. Then, we hear from an ex-Muslim on keeping religion out of government. Donald Trump’s run for the White House has thrown the GOP into an identity crisis. And this has led to a deep rift within a core constituency of the Republican Party: evangelical voters. We hear from two evangelicals -- a pastor and a professor -- who sit on opposite sides of the divide. 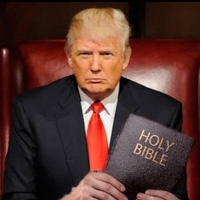 How does religion influence Trump and his campaign? Listen to our Faith Factor episode on Trump's religion. Evangelical political engagement has been a big story since the 1980 election of Ronald Reagan. But have evangelicals always been so politically active? Have they always leaned Republican? We speak with a professor of U.S. religious history to learn more about the roots of evangelical political involvement. "The biggest gathering of non-religious people in history." That’s how D.C.’s upcoming Reason Rally is being described. We hear from one of the key speakers in the lineup — Maryam Namazie. She shares her views on why religion should be separate from politics and discusses what’s at stake for atheists, and especially ex-Muslims, around the world. The rally will take place on June 4th at 10am at the Lincoln Memorial in Washington, D.C.
Thou Shalt Not Tell A Lie is a new quiz segment on Interfaith Voices. Vote here on which statement you think is TRUE! This week, we focus on a statement by Pope Francis. Recently, he met in Rome with the leaders of nuns' communities from around the world. They raised the question of women serving as deacons. The pope agreed to study the question and the press stories flew. For the record, Catholic deacons are one step below priests in the hierarchy in the church. 1: Pope Benedict opposed the idea of women deacons on the grounds that it would allow women to hear men’s confessions. 2: In the New Testament, St. Paul actually mentions a woman deacon, a friend of his named Phoebe. 3: The role of deacon was originally created to wash the feet of priests before mass, and to cook for them when they were traveling. Tune in next week for the answer!